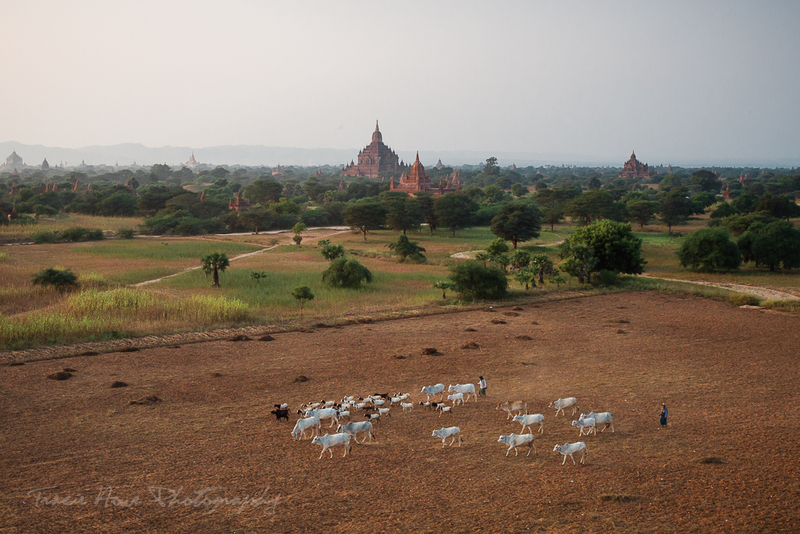 Finding the temple of my dreams in Bagan, Myanmar The misadventures of a restless photographer. Travel photographer and travel blogger, Tracie Howe, wanders the globe seeking out new adventures and photo opportunities to blog about. Join her for a unique perspective on travel, travel photography, and travel tips. Before reading the post, please be aware that many temples are no longer accessible to climb. I have not been there in a few years, so I can’t confirm the reasoning, but I’ve heard many rumors. I imagine it has a lot to do with the influx of tourists in recent years, many of whom did not respect the rules (like simply removing shoes) or got injured climbing the ancient temples. I will not update the post beyond this section, as I hear that access is constantly changing and I don’t have all of the current facts. I do think the experience to be had In Bagan is still relevant and so is much of the information that I provide. 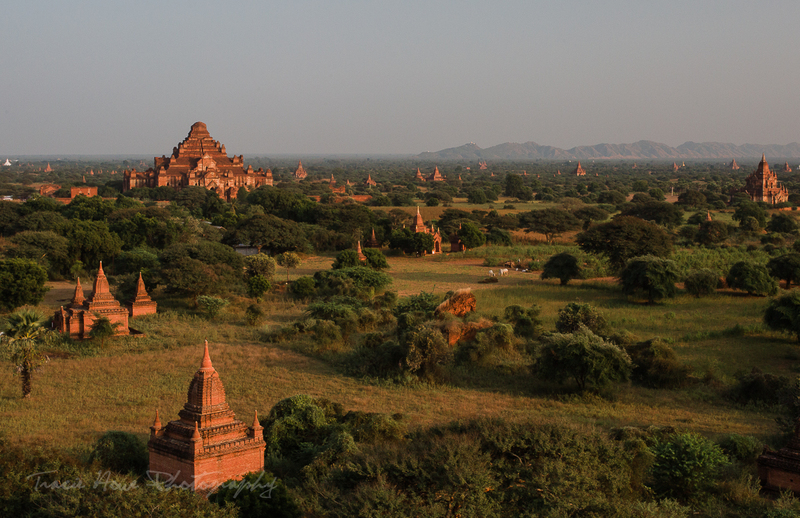 Myanmar’s beloved Bagan is a land of ancient architectural wonder and a feast for the eyes. Temples, pagodas, stupas, and monasteries are scattered throughout the plain as far as you can see. I was was never able to confidently identify every single religious structure, but I wasn’t the only one. Most of us visitors to Bagan generalized them to be temples, so that’s how I will refer to them here. Brownie points for you if you leave a comment about how to distinguish one type of building from another! In this post, I’ll start with a little background on what I was looking for in a temple and why, just in case you have the same high hopes that I did. 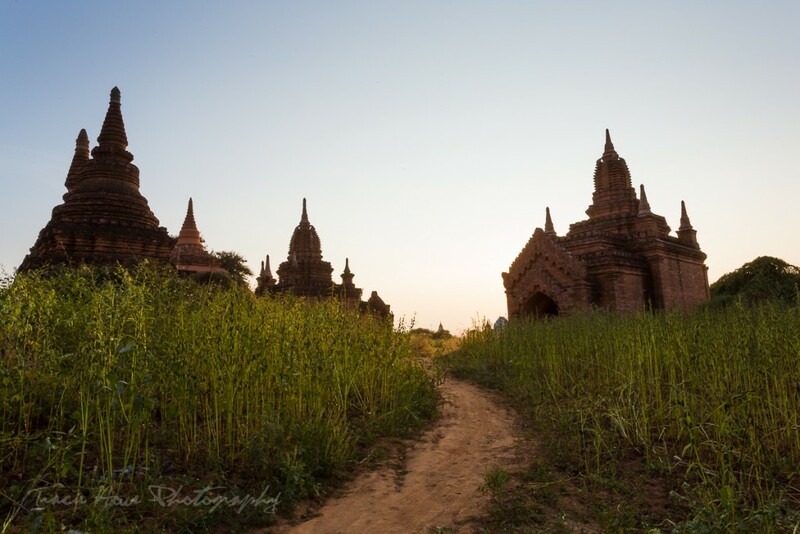 I also have a few tips for getting around and making the best use of your time in Bagan if you have the same goal of finding that perfect temple. I will then share the location of my favorite temple where I took my best sunrise and sunset photos. 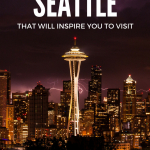 Finally, I will share a few travel and photography tips as I do in most of my posts. Enjoy! Let me first explain that my expectations for Bagan were at least 10 years in the making. 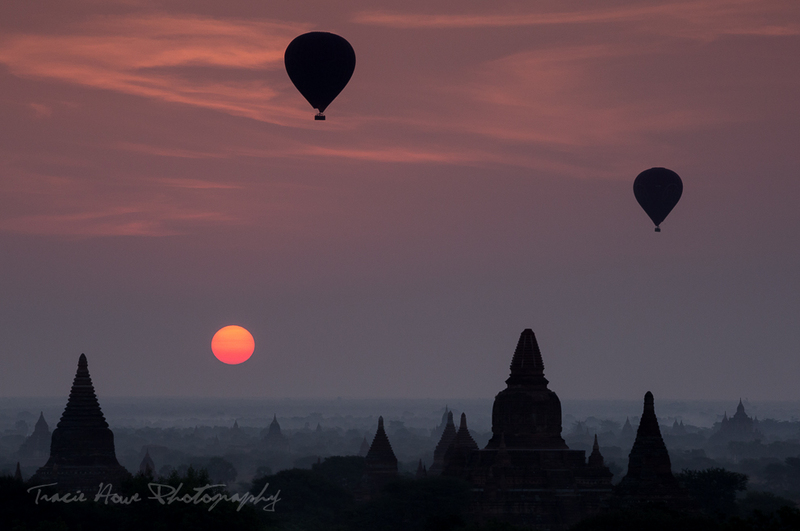 After over a decade of seeing iconic photos, I had subconsciously formed an ideal Bagan in my head and imagined what my perfect Bagan sunrise would be like. My inner peace happens when I’ve found a special place to photograph in quiet solitude, so I had high hopes to find such a place in Bagan. When I finally began to plan this long-awaited trip, I soon realized that my fantasy of floating in a hot air balloon was not going to happen (due to a thin wallet), but I still expected to experience my quiet, serene sunrise with a spectacular view. I was pleased to learn that there were plenty of temples with amazing viewpoints, but disappointed to hear that the well-known ones would likely be crowded at sunrise. My inner beast appears if a million people appear with selfie-sticks and selling souvenirs when I think I’ve found a quiet place to shoot. After many such occasions on this trip, I didn’t want another crowd to spoil what might otherwise be an incredible experience. 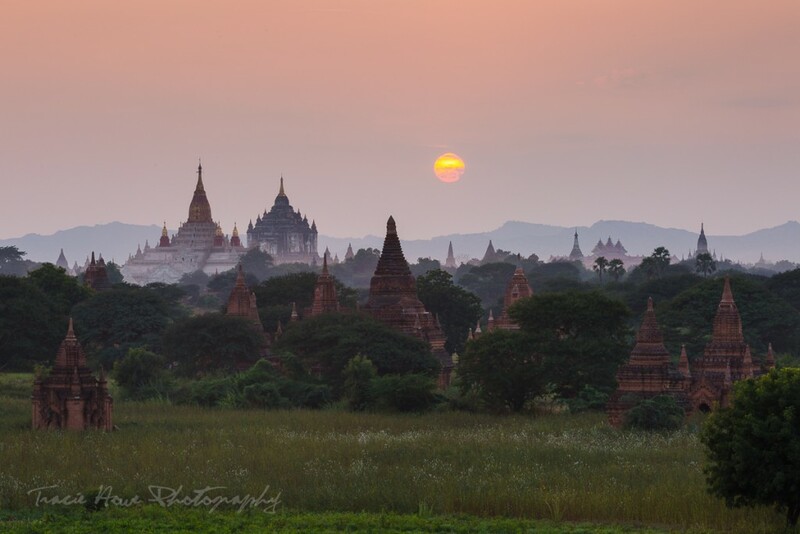 So I made it my mission to find the temple of my dreams from which to photograph a beautiful Bagan sunrise. Too many people for my taste at this popular temple for sunset. 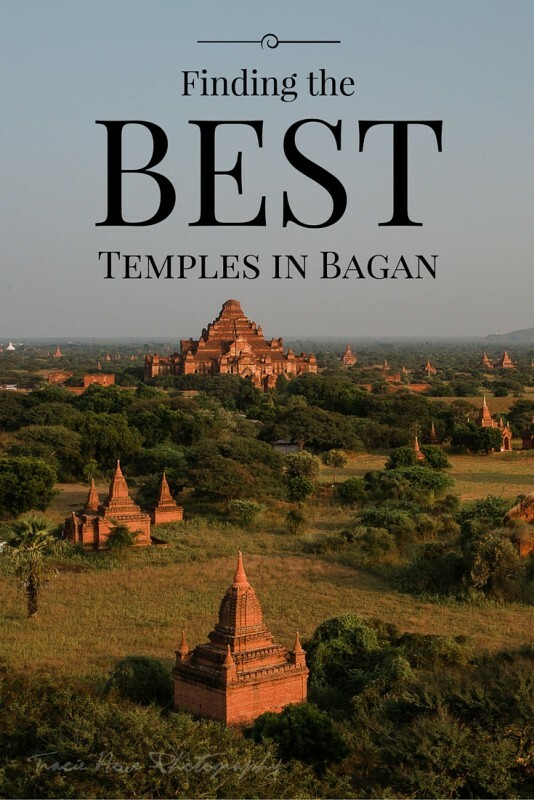 So how do you find your ideal Bagan temple? Maybe you’re looking for a glittering architectural masterpiece? 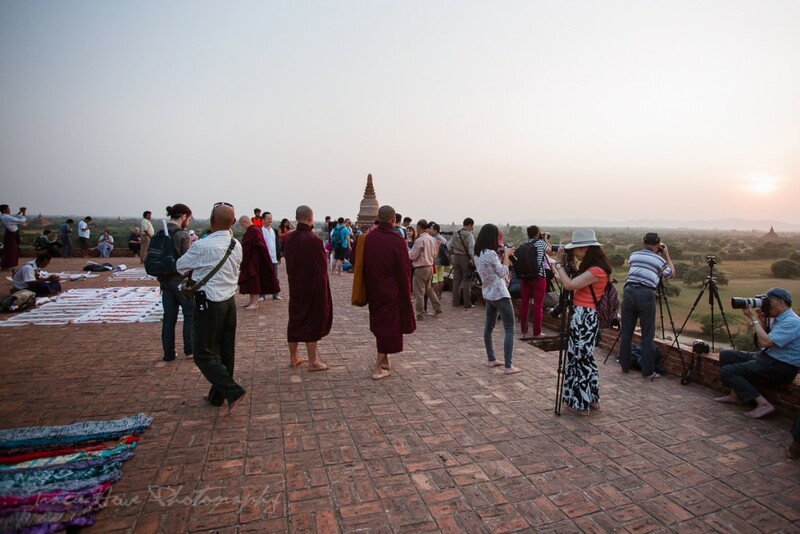 Perhaps you want to find the highest viewpoint in all of Bagan? Whatever you’re looking for in a temple, it’s important to consider the advice suggested below. I allowed myself plenty of time to search for that perfect temple. I was happy to meet a new friend who seemed to share my temple-seeking goals with just as much pickiness and determination as me. We both had 3 full days that we dedicated a good chunk of to our mission. We found a lot of beautiful places, but we both had something more in mind. Honestly, I would have been happy to stay for weeks, but with over 2,000 temples in Bagan, I knew I’d never see them all. A lovely sunrise view from this temple, but not quite the perspective we wanted. One of the unexpected delights of my visit to Bagan was in riding an E-Bike! Technically I believe these are some form of an electric scooter, but they were called E-Bikes everywhere in Bagan. There are a variety of types and sizes available. I took someone’s excellent advice and paid a little bit more for the largest E-bike with the longest battery life. I was hesitant to take a bigger bike because of my bungling motorbike driving history, but these were lighter and much easier to control. While I was there I heard several stories of people being stranded because their batteries died, and they all had the smaller versions of an E-Bike. That said, if your battery does die or you get a flat tire like I did, it shouldn’t take too very long to get help from the kind locals. Bagan is flat, but it’s big enough to spend way too much time pedaling a bicycle when you could be finding your perfect temple a lot faster with an E-bike. It’s also hot, so don’t waste your time and energy. However, a horse carriage ride might be a nice alternative for a few hours of leisurely temple-seeking, as the drivers know of some neat spots! One more thing about E-bikes. They are much safer than motorbikes, but you still need to be careful. 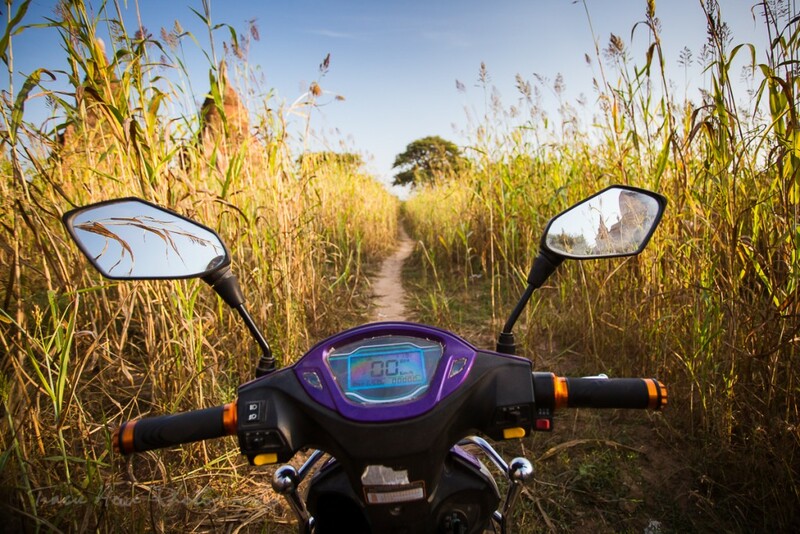 There are some deep sandy paths that you must ride slowly through. These are tricky and will make you wobble quite a bit, but if you fall you will likely only hit sand. 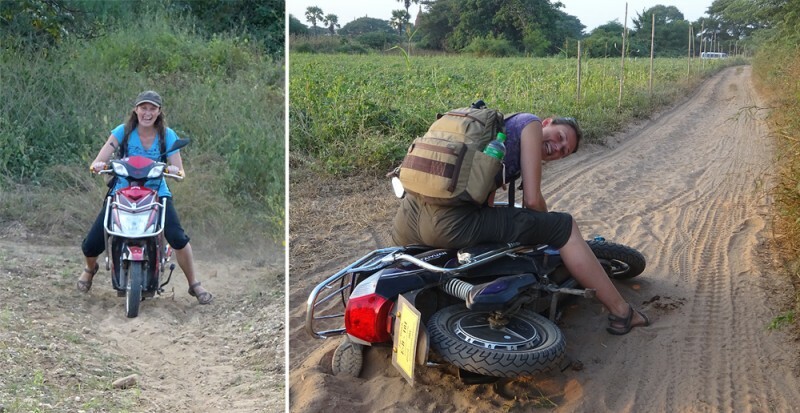 Even the largest E-bikes are not so heavy that they hurt to be trapped under… as you can see here. These photos are courtesy of my Bagan travel companion, Jolanta. Get a map of Bagan. Actually, get several maps! The maps that I was given were not accurate. There were a lot of missing roads, paths, and temples, while some appeared to be where they shouldn’t have been. I ended up using my phone’s GPS as the most reliable map, but of course that doesn’t show all the temples. It always helped to compare all the maps against each other, but seeking out specific temples was certainly challenging! Yes, I know, those are the crowded ones. However, you can at least compare the “best” views with the ones you find on your own later. If you find views to match, then you’ve probably found a pretty darn good temple! You can also survey the area around these typically taller temples and spot other potential temples to climb on your own. Besides, these popular temples can also be used as a back up plan in case you can’t find a temple that meets your fancy. A decent view from atop one of the more popular temples. Get lost. Explore! My friend and I had done some aimless wandering while trying to follow our maps, but it was on the very last evening that we realized we should have left way more time for proper exploring without the agenda of finding the perfect temple. Leaving enough time for a good exploring day will give you a richer experience and introduce you to areas you might not have found otherwise. After all, a good wander may lead you straight to the temple of your dreams! We loved discovering small paths to explore amongst the crops and tiny temples. The many hours we spent riding around each day were not spent in vain. 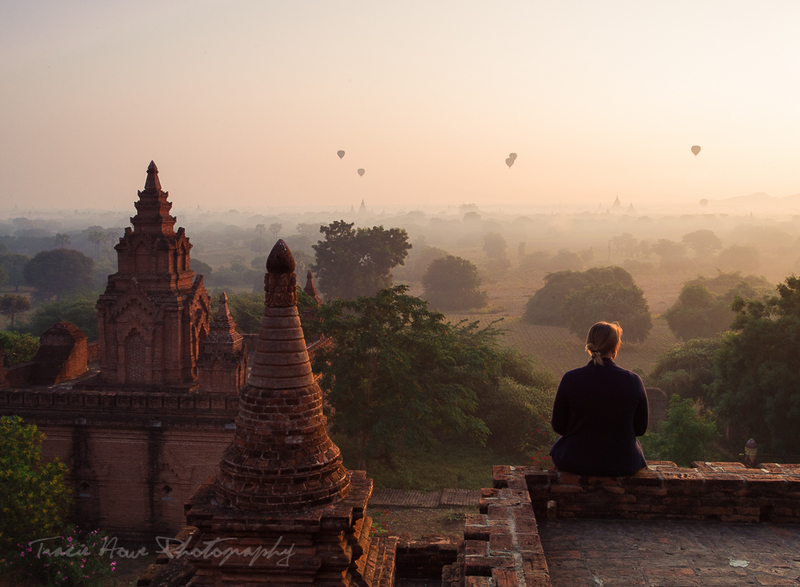 Not only did we enjoy getting to know Bagan, but we managed to find a place that we thought would provide an excellent perspective for sunrise photos. It was in the afternoon on the second day that a local pointed us towards a structure with a “good view” and “no people”. We were told that this flat-roofed building was actually a monastery, but as I mentioned earlier, they were all temples to me. We climbed up one of the tiniest, darkest staircases that we had yet encountered to discover a stunning view all around us. No one else was there at mid-day. A family did arrive soon after us, but it’s possible that they saw us standing there and realized they could climb up too. After all of our searching, stumbling upon this place as we did made us feel as if it was our secret discovery. Of course it isn’t really a secret, but not a lot of people know about it. The place is called Oak Kyaung Gyi. This monastery is a few minutes Northeast of Old Bagan and very close to Khaymingha, which might be easier to track down. If you’re coming from New Bagan and you get to Htilo Minlo temple, then you’ve gone just a bit too far. 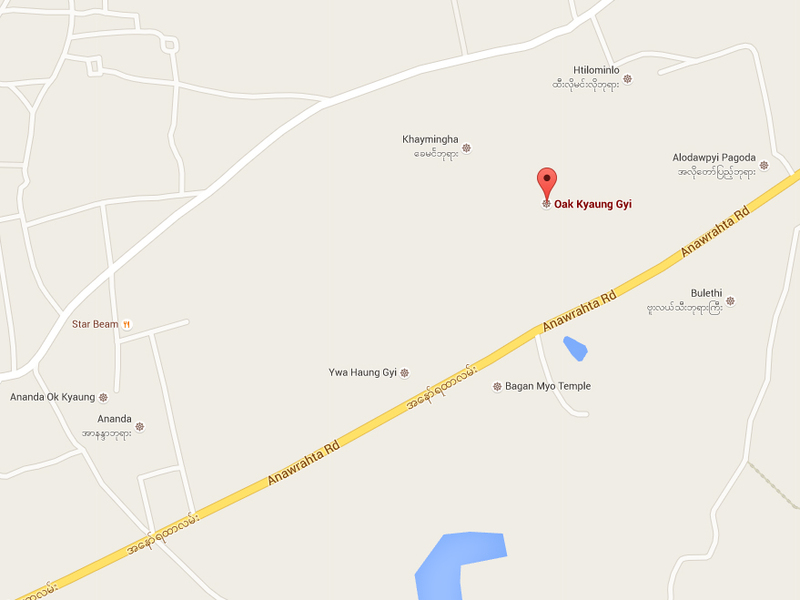 Fortunately, Oak Kyaung Gyi is visible on Google Maps, so you should be able to find it easily if you are using GPS. If not, here’s a map. After we found this lovely spot, we still continued looking for even better places. I’m sure they exist, but we didn’t find anything that met our standards. We visited some of the more popular temples and resigned ourselves to stay for a crowded sunset because the view was fine and there was no time to return to our spot. The next day was my last opportunity for a great sunrise photo and I was anxious to see if our little monastery with the pretty view could fully live up to my expectations. My friend chose sleep over yet another early morning, so I rode out on my own to find the monastery again in the dark. I gathered my courage for a creepy dark climb up the stairs and found relief once I emerged onto the empty roof. I set up my tripod at the highest point and waited for all the stars to align (well, the sun and the hot air balloons in this case) for this moment I had been dreaming of for so long. The sun popped up as red ball just near one of the larger temples and the hot air balloons began floating towards it. It was magical and I was able to experience it in perfect solitude! High on the adrenaline of the experience and content with my photos, I was happy to explore Bagan more casually for the rest of the day. My friend agreed to join me for some wandering and we decided that our monastery would also make a good place for sunset if we didn’t happen to find a better one. Without the stress of seeking out a temple for sunset, we were able to enjoy ourselves just a little bit more during the day. We did go back to the monastery for sunset and found that a small group of photographers had been brought there by a guide. Since I had already enjoyed my serene moment and there was plenty of space to take photos, this didn’t bother me very much. The fact that photographers were brought here, validated my decision to come here. Besides, the group did what most people do when photographing sunset. They left soon after the sun went down. So my friend and I stayed a little longer for the magical light of blue hour and enjoyed the our last evening in Bagan totally at peace. I suggest wearing warm clothes for those early mornings. Racing your E-Bike (at 50km/hr) to your temple of choice can make for a chilly ride, and temple tops can be breezy. Shoes that are easy to slip on and off are recommended. You’ll have to remove your shoes at every temple entrance and I expect you’ll be seeing a lot of temples! Bring a flashlight/torch with you to light the dark staircases. Just a warning that those cute, friendly kids you’ll see will probably try to sell you something. They start off innocently enough, asking where you’re from to start a conversation, but 95% of the time they will end it with a plea to buy something. And if you’re like me, you’ll regret not taking them up on the offer… I missed out on a painting I liked because I was too stubborn to show any interest and I never found one like it after that. First of all, I highly recommend that you bring the longest lens that you have. Those temples were not as close together as I had imagined, but a long lens will compress the background to make them appear closer to the foreground. And if you do find yourself at a not-so-perfect location, you can at least zoom in for a better composition. If sunrises and sunsets are at the top of your Bagan list, a graduated neutral density filter will help you to even out the exposure between foreground and background. A graduated neutral density filter is half darkened so you can darken the sky while the foreground stays properly exposed. Just popping one into a square filter holder in front of your lens will let you see the difference. I love these things! It’s almost like HDR, but you get it right in camera with one shot. Scout your spot before you actually have to shoot it and carefully mark it on a map before you return. This is especially true for sunrise as it can be difficult to notice that little path you’re supposed to take in the dark! I don’t normally retouch things out of my photos, but I didn’t hesitate to for that sunrise shot I’ve been dreaming of! I removed a few people barely noticeable on a distant temple and I’m happy that I did. I generally don’t condone the use of retouching in Photoshop, but if an image means a lot to you, don’t be afraid to tweak it until it’s perfect for you. Thanks for sharing a great spot for sunrise and sunset. 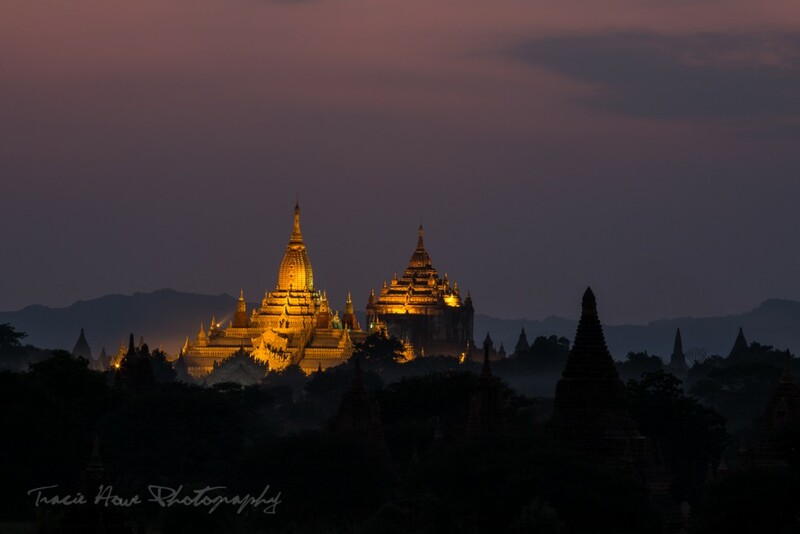 i am going to Myanmar this Dec. but never have good sunrise and sunset photo, either sun too bringht or the sky too dark, could you share some tips of the Shutter speed , ISO and appeture setting to avoid that, trying to do the same mistake of my previous sunrise shooting. I’ll be there for a couple of day to shoot a small wedding and I I’d like to ask you if you found some temple with nice God Rays…any help on this matter will be more than appreciated!